At the “Walls of Byzantium” you will find the origins of today’s headlines. 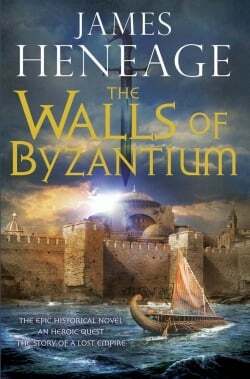 The walls themselves appear, in their stones, only briefly in this first book, The Mistra Chronicles: The Walls of Byzantium, by James Heneage, but their presence permeates the story as a question about empire, its benefits – but also its costs. With a moment’s thought we can identify three empires in contention around those walls: the Rhomaioi, understood in that time as the surviving remnants of Constantine’s and Justinian’s eastward re-encampment of the Roman Empire and only later, in the 16th century, given the designation “Byzantine”; you would also recognize the Western “Roman” empire, scattered and reformed into the “Christian Kingdoms” of Europe and the Roman Papacy; and you would know about the Islamic Empire, by that time not Saladin’s of earlier crusades, but of the Ottoman Turks, whose dominions lasted up to World War I and within which today’s most serious territorial contentions are rooted. Beyond the Ottoman’s, far to the east, however, was a fourth which might be unfamiliar to most medieval fans, the “empire” of Tamerlane, threatening both the Ottomans and Europe. Heneage discloses to his readers that it was not, in fact, the bravery (or the smarts) of the European resistance to Ottoman expansion which staved off the conquest of Europe, and therefore had been threatening (of importance to Heneage as author, and in the thoughts of his in-novel surrogate, philosopher Plethon) the burgeoning Renaissance out of which reason and enlightenment would triumph over dogmatism, east and west (would that it had!) . Rather it was Tamerlane who drew the attention of the Ottomans eastward rather than westward, although the conquest of Constantinople – and its walls – was by that time never in doubt. The “clash of civilizations” (to use Samuel Huntington’s phrase) are not the only seeds of modernity we find at those walls: all three empires wrestling there were concerned with trade as a “to the death” issue. Not as glamorous as might and main, perhaps, but the grotty bedrock of “civilization” (in all its ambiguity), the making of money, “trade”, had furthermore produced an entity with which we are ambivalently familiar today – the corporation, relatively closed associations of the wealthy that governed resources, territories associated with them, and their passage, as manufacture and commodity, to market and bank – corporations strove to influence, if not control, those empires, their rulers, military might and administrative bureaucracy – and therein lies the tale to be told. To get through this maze, Heneage employs the time proven and very useful conceit of human interest at its most personal level – a love story, not merely triangular but quadrilateral, plus the ardent love of place (he admits to have fallen in love with his intro settings, Mistra and Monemvasia, which still exist) and a heritage of honour for his hero, Luke. Around the Emperor at Constantinople were guards of, first, Scandinavian provenance – the Varangians, and later, according to Heneage (both in the story and in the historical notes) and news to me, of English origin, specifically escapees from the Norman conquest of 1066, who fled in “long boats” and somehow took up the duties of their Scandinavian brethren. So in the middle of this political, economic and military maelstrom, we have an Englishman, albeit three Greek generations descended, to guide us, who wields a dragon sword in the service of undying love. And to put the cherry on top, a la Dan Brown, we have a treasure which could make – or unmake – the “Byzantine” empire, there on its very death bed, a treasure found by the end of the book – but kept a mystery – apparently to be continued in the next instalment of the series. Heneage has a nice turn of phrase that sometimes gets out of hand (verdigris eyes ?) but the story does take you along on its ride, while making you uncomfortable about the history out of which our modern world was formed: that “Englishman”, confronting the Ottomans, to rescue reason and enlightenment, had me wincing even as I turned the page for the next miraculous escape to destiny. The walls of Byzantium have their own secrets and therefore stories, as do the Varangians, told in other books – what this book is about is neither stones nor personalities, but social and cultural forces that have gotten out of control and rode then – and now – roughshod over lives and land. Our headlines, indeed, lie seeded at the foot of that rubble which is why the title is apropos regardless of the scant appearance in the book of those walls of Byzantium.